The Lady ‘Dogs turned in impressive results on a challenging Rockwind Community Links course in Hobbs, undershooting the score necessary to earn their second Class 5A State Tournament leg by 59 shots and bettering second-place Goddard by 29. “The girls played really well,” coach Jeff Davis said today. “They did a great job on that course. The greens are so big over there, we had to make some adjustments, but those girls are so level-headed – if something happens, they just forget about it, and they go get the next shot. 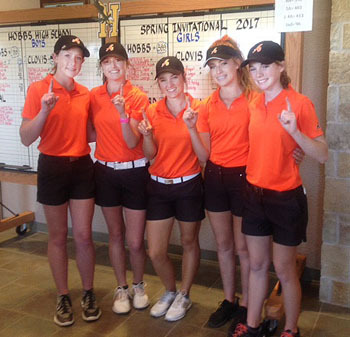 Josey Jackson led the way for Artesia with a first-place overall finish individually for her round of 77. On her heels in second place overall was Taysea Powell with an 81, followed by Brehnan Davis (89), Teagan Archer (97) and BriLe Ybarra (104). Jackson, Powell and Davis’ scores earned all three girls their second individual state qualifying legs. On the boys’ side, the ‘Dogs missed qualifying their first of three state legs by just three shots with a team 332, but the squad did notch their inaugural individual qualifications of the season. Earning that achievement were Wesley Davis with a round of 79 and Parker Sanders with an 80. Davis’ round was also good enough for second place overall individually in the tournament. As an example, senior Giovanni Huitron and a golfer from Jal chipped simultaneously; the balls collided, and both were knocked off the green. According to the rules, the balls must be played as they lie. “What kind of hurt Giovanni was he went from being on the fringe to being 10 yards off the green,” said Bean. “So it was just little things like that. But the conditions were perfect, and the golf course was amazing. Rockwind Community Links is a fantastic golf course, and the people in Hobbs ought to be proud to have it. We just had a couple of things happen during the round that cost us getting a leg. Rounding out the Bulldogs’ performance Wednesday were Jake Craft (81), Huitron (92) and Jake Nelson (95). The teams were competing Thursday in the Roswell Alien 8 at the NMMI Golf Course and will cap off their Spring Break marathon Friday at The Links at Sierra Blanca in Ruidoso. “It looks to me like the girls are playing pretty well so far, so we’ll see how it goes,” said Davis from NMMI, where the Lady Bulldogs looked this morning to be on pace for their third and final team leg. “We’re here at NMMI, playing great, and life is good,” said Bean.